This week I had the privilege of lunching at my favourite restaurant of all time, Umu, which is in Mayfair, London. The Michelin-starred Umu specialises in traditional kaiseki, probably my favourite cuisine of all. Kaiseki originates from Zen Buddhism. In Buddhist monasteries monks would not consume any food after noon, so in order to manage their pangs of hunger they used to carry around a heated stone against their belly underneath their robes. In Japanese, ‘kai’ means ‘bosom’ and ‘seki’ means ‘stone’. The phrase then slowly got associated with a particular kind of very light cuisine, which practitioners of the Japanese tea ceremony would serve to counteract the high caffeine content of matcha (powdered green tea). The background to this is also very interesting. Sen no Rikyu (1522-1591) was a great man, thought responsible for bringing not only Buddhism from China to Japan but also tofu, noodles, tea and the tea ceremony. However, quite early on in the history of the Japanese tea ceremony, the intensity of the actual tea served at the ceremony, the matcha, was found to be almost too much to stomach, so it became the practice to accompany the ceremony with a small bowl of miso soup and three light side dishes, served usually in the middle of the day-long ceremony. I had the pleasure of enjoying the tea ceremony in a 400-year old tea house in Kyoto last year and enjoyed a very simple kaiseki repast involving simmered vegetables and fish fillets delicately prepared and cooked. Sakizuke: the first course is an amuse-gueule, served to excite the tastebuds, preparing you for the meal and offering a glimpse into the delights of the chef’s cooking yet to come. 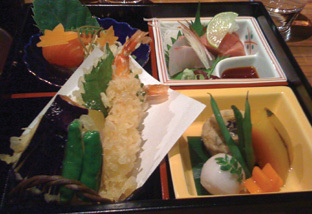 Hassun: the second course sets the seasonal theme and consists of one kind of sushi and five or six small side dishes. 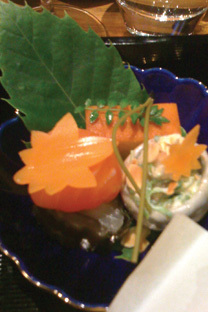 Mukozuke: the third course is typically a sliced dish of seasonal sashimi. Takiawase: the fourth course is a medley of seasonal vegetables and fish, meat or tofu, all of which are simmered separately. 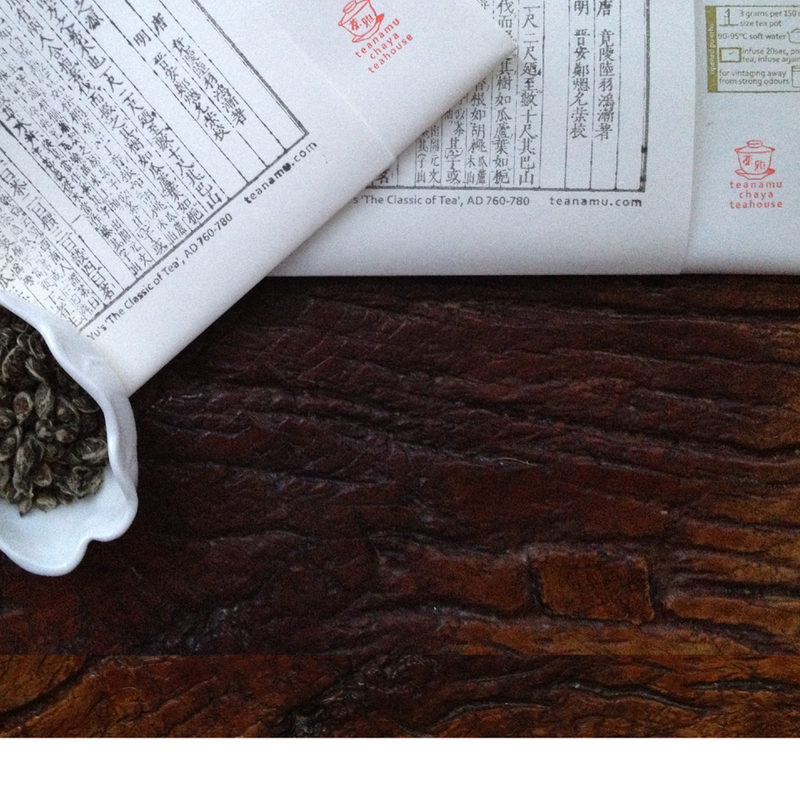 Notice the Japanese ‘obsession’ with using only ingredients that are in season, an approach which Umu fully embraces! Futamono: the fifth course is a lidded dish, often something substantial like a hearty soup. Yakimono: the sixth course consists of grilled seasonal fish, bamboo or tofu. Su-zakana: the seventh course refreshes the palate with crispy textured seasonal vegetables or wild plants in a lightly vinegared dressing. Hiyashi-bachi: the eight course is just for the summer, and comprises a chilled vegetable dish. Naka-choko: the ninth course is another palate cleanser in the form of a very light dish such as a chilled tomato soup. Shiizakana: the tenth course is either a simmered dish or a hot pot. Gohan: the eleventh course is typically cooked rice with seasonal ingredients or mixed sushi. 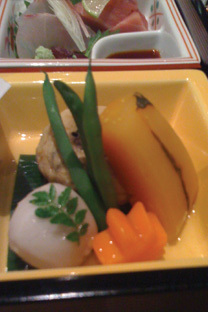 Ko no mono: the twelfth dish consists of seasonal home-pickled vegetables. Tome-wan: the thirteen dish is typically soup (miso or a seasonal vegetable potage) served with rice. Mizumono: the last dish is a seaonal dessert chosen from a range of traditional sweets and confections. Arashimaya appetizers consisting of a small rolled seabass with konbu seaweed, crunchy bitter cabbage coleslaw, a sweet egg omelette Tamago, and a little smoked salmon ball covering the most intense sunset-orange, runny egg yolk. On my latest visit to Umu I chose Arashiyama from the set lunch menu. Arashiyama is like a bento box consisting of an assortment of appetizers, a seasonal simmered dish, chef’s selection of raw fish, rice, and a choice of grilled fish or poultry of the day or tiger prawn tempura. A seasonal simmered dish consisting of a minced mackerel ball, ‘mud potato’ (like a yam), simmered pumpkin and seasonal greens. All the items are simmered separately so that they retain their individual tastes and flavours. While I am a little uneasy about Chef Ichiro Kubota’s policy of importing fresh ingredients from Japan on a daily basis – think of poor planet earth!! – I always without fail feel very blessed and special when dining at his restaurant. The care, attention and precision that the chef puts into each constituent part of each dish is truly astonishing. Take the appetizers for example. They consisted of a small rolled seabass with konbu seaweed, crunchy bitter cabbage coleslaw, a sweet egg omelet Tamago topped with a single sprig of kinome (young leaves of the Japanese Sancho pepper) adding an intense peppery herb flavour, and a little smoked salmon covering the most intense sunset-orange, runny egg yolk. I am most intrigued by this egg yolk. We have something quite similar in Chinese cuisine, in the form of salted duck eggs. The eggs are soaked in brine and cured, so that most of the moisture in the egg is removed. This produces a deep orange yolk that is used in savoury dishes or sweet cakes. I do not know how Umu achieve the effect but I suspect there is some form of curing involved. Indeed, Chef told me that to create these deeply intense egg yolks, half boil the eggs and marinate them in miso. The glucose from the marinade will draw out the water in the yolks and transform them into a beautiful deep sun-set orange colour. A very quick internet search reveals another clever albeit very labour intensive way of curing egg yolks. Bring a salty Swiss meringue (2 parts egg white, 1 part sugar and 2 parts salt) to stiff peaks. Using a dome–shaped silicon mould, make a bed with the meringue and carefully place an egg yolk in each mould. If the yolk breaks replace it with a new one. Then, carefully cover each yolk with meringue. Refrigerate for 8 hours and repeat the whole process 2-3 times. When curing is done, carefully remove each yolk from its meringue dome. Discard the meringue dome after each use. Rinse the yolk till clean and air dry in the refrigerator for 24 hours. This is definitely a project that I will be trying! PS: Umu Restaurant is located at 14-16 Bruton Place, London, W1J 6LX. Telephone: 020 74998881. Email: reception@umurestaurant.com. What I like so much about these kinds of meals is that they’re so light but there’s the incredible variety. I’m a light eater myself but when I go out I want to sample many different kinds of foods as long as it isn’t much of each. It’s highly seasonal. During winter, they tend to include more nimono (煮物). Admittedly, the individual items are simmered separately, I do feel the need to eat it ever more carefully to experience the flavours. Despite that, it is always a pleasure to eat kaiseki.